Ex-Gay Self Loathing Homos Whine: Put Us In The Smithsonian Exhibit Too! Home/Featured/Ex-Gay Self Loathing Homos Whine: Put Us In The Smithsonian Exhibit Too! 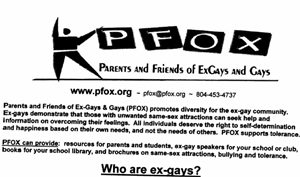 The self loathing homos over at PFOX (Parents and Friends of Ex-Gays and Gays) are stamping their delusional hateful little feet and screaming for inclusion in the Smithsonian’s LGBT history exhibit. The Smithsonian’s exhibit’s curator is not only open to that, he plans on including materials from numerous anti-gay groups. Personally I have no problem with this. Both the good and bad in our history and the hatred that we have to overcome should be presented also. I just hope that they make jars of formaldehyde big enough for the ex-gays to fit in for display. Mitt Romney Stiffs Baristas, Offers Them His Half Drunk Hot Chocolate Instead.